This week I want to introduce you to The Dunes Golf and Tennis Club near the causeway on Sanibel Island. The Dunes Website describes the Dunes as, "a lush Sanibel Island golf course and club destination nestled amid an abundant natural landscape," and I have to agree! The Dunes is definitely an all time favorite! The 18-hole championship golf course is open to the public. The golf course was designed by 10-time PGA Tour winner Mark McCumber. 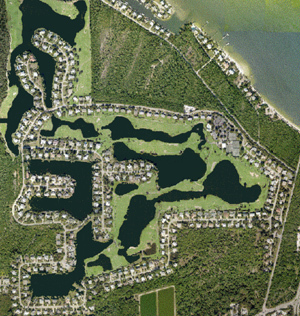 The Dunes subdivision consists of approximately 215 properties surrounding the golf course and Sanibel's natural environment. There are single family homes as well as duplex homes. If tennis is your game, The Dunes has 13 Har-Tru tennis courts and offers daily services such as clinics, lessons, assistance with scheduling match play and junior tournament training. You can also fill in your day by visiting The Dunes Restaurant located at the clubhouse. Known for their delicious Angus Beef, the restaurant also offers one of the best views as you enjoy your meal. Located close to shopping, the bay, and some of our best beaches near the Sanibel Lighthouse, The Dunes is always a popular place for locals. There are currently 13 listings available. Asking prices range from a three bed, two and a half bath for $324,900 (2160 sq. ft.) to a three bed, three bath for $1,200,000 (8490 sq. ft.). The Dunes is always worth a look if you are in the market for Sanibel property! Along with everything The Dunes has to offer, Sanibel Island has lots to keep you busy. We have miles and miles of famous beach as well as over 60% of the island being preserve property. Our most popular conservation property being the Ding Darling Wildlife Refuge. When you finish with play, shopping on Sanibel is always a fun time! We have some of the best boutique shops for you to discover. As always, please contact me for any local information you need! I live here and I'm always excited to talk about everything Sanibel and Captiva Islands have to offer! For more information about The Dunes and to watch a visual tour, just check out this webpage! It's summer and a great time to start thinking about some of the great properties we have available. Interest rates are at historic lows and prices are reasonable - now's the time!